As a species, we’ve done a pretty good job at inventing some useful devices. But as clever as we think we are, given sufficient time, natural selection will beat us at our game at almost every turn. So it makes sense that many of our best inventions are inspired by nature and the myriad ways life finds to get DNA from one generation to the next. Hook and loop fasteners are one such design cribbed from nature, and the story behind this useful mechanism is a perfect example that a prepared mind, good observation skills, and a heck of a lot of perseverance are what it takes to bring one of Mother Nature’s designs to market. Editor’s Note: As some predicted in the comments section, we were contacted by representatives of Velcro Companies and asked to change all mentions in this article to either VELCRO® Brand Fastener or to use the generic “Hook and Loop” term. If it seems weird that we’re calling this hook and loop, now you know why. If you’re going to be inspired by natural mechanisms, it pays to be out in nature. During a hike in the Alps with his dog in 1941, George de Mestral, a Swiss electrical engineer, found his inspiration. He and the animal had picked up a multitude of burrs during their walk, and as George picked them out of the fur and off his clothes, he wondered how they managed to attach themselves so tenaciously. 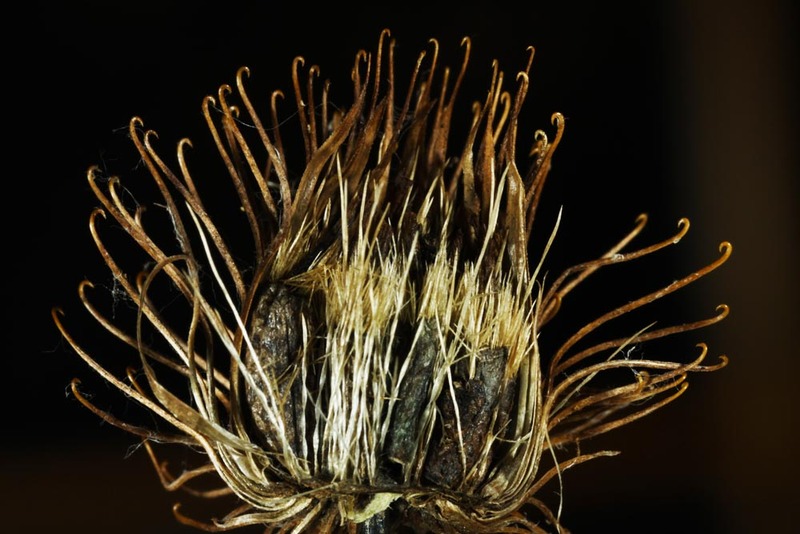 For anyone unfamiliar with these unwelcome travelers, burrs are the spiky ripe fruit of any of a number of plants, most commonly the Burdock. The burrs are a dispersal strategy used by the plant to send its seeds far and wide by hitching a ride on the coat of a passing animal. George put a burr under a microscope and was fascinated by what he saw. Each spike on the burr ended in a sharp point that looped back into a hook shape. Mixed in with the spikes were strands of the dog’s hair, knotted and tangled around the multitude of hooks. What’s more, the wool of his trousers and socks, standing out from the surface of his clothing as tiny loops, were the perfect medium to catch the burr’s hook. In that moment, George found inspiration for a new kind of fastener, and he would labor for the better part of a decade perfecting his invention. Early prototypes using natural fibers worked, but not for long as the shape of the mechanism quickly wore out. George found that the new miracle fiber Nylon was perfect for hooks and the loops that would stand up to repeated use, and was soon able to create small amounts of working fasteners. But perfecting a mechanized process for creating the stuff proved difficult. He finally hit upon weaving stiff Nylon threads into loops while heating the thread, causing it to stick out from the backer. A clip with shears then formed the hooks, and loops came from thinner threads similarly woven but left unsnipped. US patent 2,717,437. George patented his idea and trademarked the name “Velcro” (from velour and crochet, or hook) for the product and his company, which is still in business today. Interest in the new fastener was anemic at first, but got a boost when the budding American space program incorporated de Mestral’s product into spacesuits and used it for sticking things down inside spacecraft. 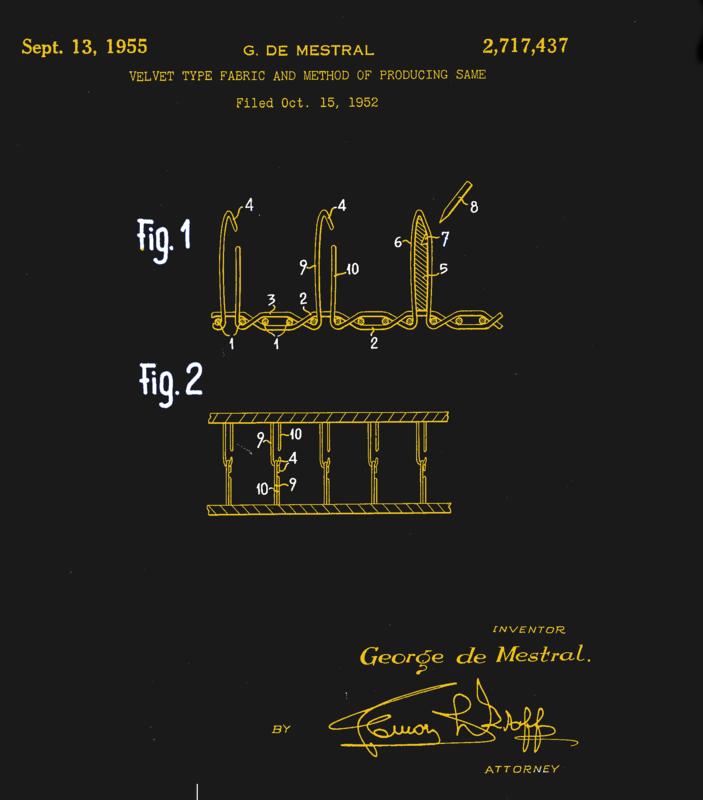 Once de Mestral’s patents finally ran out in 1978, hundreds of companies swooped in with generic versions of the product, categorized under the bland “hook and loop fastener” banner. But like so many successful inventions, the brand name has become the name everyone uses, and hook and loop fasteners have become ubiquitous, with applications ranging far beyond the textile industry that was originally targeted. The primary advantage of hook and loop fasteners is that it doesn’t require alignment to work. Unlike a zipper (one of our most favorite mechanisms), which requires engagement of the two sets of teeth, if you get the hook piece anywhere near the loop piece, chances are pretty good they’ll stick. This actually works out to be a problem, too, in that garments can end up misaligned — stage costumers tend to shy away from hook and loop fasteners even for quick-change costumes for that very reason. It’s also pretty common to have the hook side snag fabrics with any kind of nap, not just the intended loop material. And who hasn’t seen a hook side matted with lint and fibers that reduces its holding power? But in general, the strength of this mechanism is pretty impressive. The bond between the hook and the loop part is strong both perpendicular to the mating plane and in shear, thanks to the thousands of entanglements that have to be overcome to break the bond. But if the two halves are peeled apart, the breaking strength is lowered dramatically by breaking only a few connections at a time. In terms of materials, the hook and loop fastener concept has gone far beyond the original natural materials de Mestral worked with. Nylon and polyester rule the consumer market, but NASA has developed high-strength fasteners for harsh conditions with more exotic materials such a Teflon and glass fibers. And a German firm has developed a terrifying steel version of the fastener that can carry up to 100 N/cm². One square foot of that stuff could support 10 tons. Hook and loop fasteners have come a long way in the past 70 years, going from textile oddity to an indispensable fastener in almost every industry. That it started with a burr on a dog is a testament to what can happen when we pay attention to what nature has to offer. It’s called hook and loop! I have always loved that video. Any company with a sense of humor is good with me. You have to wonder where their lawyers were. I thought the lawyers were in the video. Are those the actual lawyers? They are all impressive singers. Did they have to write about their singing and stage skills on their resumes? I’ll guess that they will like the Swedish word for it, since it is “kardborrband” literally meaning “burdock band”. The Norwegian word is “borrelås”, literally “burr lock”. Actually never thought of that! Scandinavian high five! Same here. Looks like they just messed up the test and used a thin nylon string that melted first. I imagine the velcro (fcuk saying hook and loop) melts together and becomes stronger, and then would eventually fail… compared to metal velcro. The funny thing about the “hook” as DNA propagator is that it depends upon everyone being furry. Bet we threw that for a loop. Last I checked, most humans still typically have hair on several areas of their body. In fact it depends upon that there are just enough furry animals and perhaps it can hook to some feathers also. What’s bizarre to me is that you can (in certain jurisdictions) take what nature has developed and done for millions of years and then essentially replicate it and patent it and then proclaim that you invented it and then be afforded first to file protections on your “invention”. Then when your name becomes a proprietary eponym, used by the majority of the world to refer to this item outside of the context of a registered trademark, you continue to complain about it. I guess at least there is now prior art on this particular invention and it is no longer afforded patent protection (in any jurisdiction)? The Divine needs no forms. Of course not. Why should imaginations/collective halluzinations need forms? Velcro is made by using burr DNA to grow hook/loop strands? I thought it was created by using Mestral’s novel manufacturing technique. I was WAY off. Thank you. I heard that after the inventor died, his widow was destitute. The company found out and gave her a nice stipend. Ren – Only left her a chateau in Switzerland! And the name VELCRO only means “Velvet Crochet”. De Mestral named it that and the company is still operating even since the patent expired in 1978. I first saw it’s use in ST-TOS when Capt Kirk pulled his phaser off of it on his hip. I thought velcro was invented by aliens, furry, furry aliens. Velcro is IMHO one of the worst cases of consumer desinformation ever happened! Was praised resp. was always promoted as being particularly strong (some commercials even showed a man being attached with velcro to a wall), but in reality, everything below industrial grade velcro (especially the stuff used in the fashion industry) wears off at light speed and is beaten in terms of strength and longevity by regular snap-fasteners. I find that a snap fastener’s holding strength drops off massively with misalignment. +/-1mm and it has dropped to zero. My REI rain jacket is over 25 years old now and its velcro fasteners still work perfectly at their designed task of holding the rain flaps closed. However many of its snap fasteners have failed and I have had to take it back to REI several times to get the snaps replaced (for free!). I’d be curious how that metal fastener goes after it’s rusted together, if it’s still possible to separate it without too much annoyance. Skydivers use tons of Velcro. It does things like attach the pilot chute to the main parachute. The skydiver typically pulls the small pilot chute out of a special pocket on his harness, the 120+ mph slipstream catches it and the pilot chute then pulls the main chute out where it quickly slows the skydivers down to a safe landable speed. I once read that a French skydiving club gave the inventor a testimonial dinner, which I thought was nice of them.